My in laws are in London at the moment and I'm just a bit envious (okay, more than a bit). Ah.... I really, really love London and I'm envisioning the fancy buildings and tall buses, the grandeur and excitement! Traveling is just the most wondrous thing ever, isn't it? 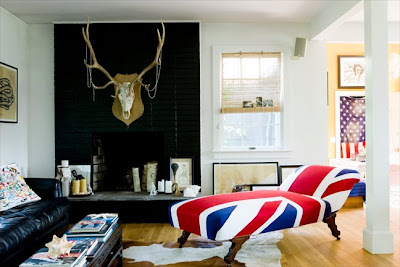 I'm hoping they'll bring back a British flag for the kids room. Rock 'n Roll it up a bit. 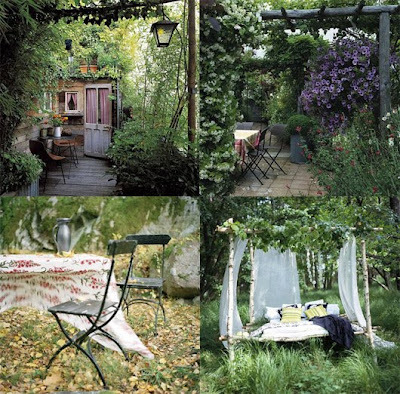 I found these gorgeous photos of slightly overgrown but oh so elegant outdoor spots. My own garden is, at the moment and particularly on the side of the house, quite wild and wonderful ... the plants having a mind of their own. I'm just going to say that it's all on purpose and really what I'm creating there is a carefree English garden. I think, with the right touch, it could definitely accomplish this, with arbors and lanterns, benches and tea. And with a good clean up, maybe look a little like this?